This past week we’ve been hard at work picking all the berries from the garden. 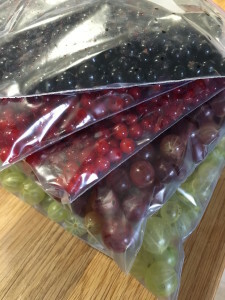 Red and black currants, raspberries and gooseberries. Today we finished off the last of it – with the possible exception of raspberries, we might get another liter or two from the garden with a bit of luck (and sunshine). As I was taking care of all the berries, bagging them and preparing them for the freezer, I watched the documentary A Plastic Ocean. Far from a feel-good-documentary, but well worth the watch. But honestly, sometimes it get’s too much, hearing about horrendous amounts of harm the human species is capable of. Tonight was one of those nights, making me almost paralyzed with the futility of even making the smallest of efforts. And yet, as I was bagging my berries in Ziploc plastic bags, I know that these are bags that will be reused, over and over again. Because I do reuse all the plastic bags I use (and they aren’t that many to be honest), after washing them out, having them dry off in the dish rack. I do make that effort, and gladly at that. Living in Malmö in Sweden, I also know that once the Ziploc bags are torn and I will throw them in the trash, they will go to the city incinerator, which generates a lot of heat for heating houses in town. Probably not the best idea anyway, burning plastic is far from ideal, but hopefully it will stay clear of becoming micro plastic in the oceans at least. If you’ve yet to watch A Plastic Ocean, please do!